They say they gave their time protecting and serving the city of Romulus and now they fear they will lose the heath care coverage they were promised. Retired policemen say they plan to speak out at the Romulus City Council meeting Monday at 7:30 as the city decides on cuts to worker and retiree health care. 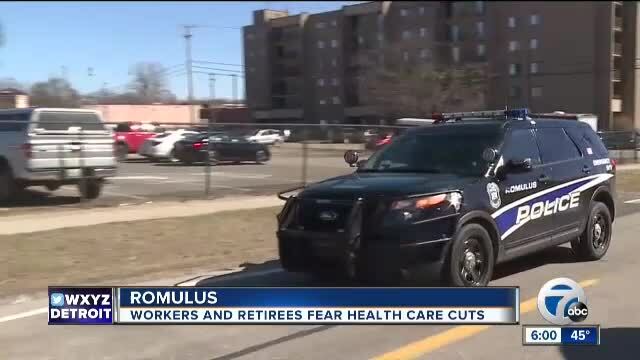 ROMULUS, Mich. (WXYZ) — They say they gave their time protecting and serving the city of Romulus and now they fear they will lose the heath care coverage they were promised. Retired policemen say they plan to speak out at the Romulus City Council meeting Monday at 7:30 as the city decides on cuts to worker and retiree health care. “It is a broken promise,” said Cliff West, a retiree. Cliff West says he gave his time to the Romulus Police Department because the job promised excellent health benefits. Now he fears those benefits are being taken away when he, his wife and young son most need them. Cliff West has cancer and a rare disease that has left him wheelchair bound. Retiree Chris Imperati says he relies on the health benefits he earned during his career to take care not only of himself, but his family. His daughter has cerebral palsy and requires significant medical attention. The city sent a letter to workers and employees. It says the cost of health care keeps increasing and for the good of the city action needs to be taken. The proposed cuts in heath benefits impact both current workers and retirees under age 65. Last year the city council opted out of Public Act 152, an act that put a cap on how much local governments paid for health care unless 2/3 of its council voted out. Council is expected to decide whether to opt out again. City leaders tell Seven Action News the city has more costs than tax revenue, so difficult decisions need to be made. The city has come up with alternative health plans that would cost $4500. Retirees say they fear the coverage under the alternative plan would provide less care. If retirees impacted want to keep their current insurance they have been told the cost will be significant. “Right now I pay about $47 a month. I am told it will be around $850 if these changes go through,” said Imperati. City Leaders say making these changes in healthcare would take care of about one third of the cuts that need to be made.